In the past several days I've been diagnosed with a vitamin D deficiency, my levels are pretty low. This is actually pretty serious and can affect a person in several ways. It is the leading culprit for my fatigue, not the chronic pain that I've blamed (on the advice of my physician). The new acupuncturist, JS, is the one who guessed it on the basis of my saying how markedly better I felt in Hawaii. Am taking a pretty enormous dose of D right now. In 12 weeks they'll test again and see if I'm any where near "normal" levels. Apparently it is fairly common in Portland to be low on it. I guess there's been a lot more attention on it recently and more doctors are testing for it now. Still having a lot of acupuncture done. Another session focused on detoxing the body, again the heart-protector. Again I suddenly went from feeling absolutely fine, doing zazen with needles in my back, and then I'm suffused with grief and feel a headache & nausea. Not quite as intense as the first time, but pretty significant. Was doing better and then Thursday the head pounding came back again during our Zen community cohort dinner/meeting. We went home, I went to bed early. Friday through Sunday was down and up, and down again and a shaky even into feeling rather tired today. Saturday was the big "up" in the middle of the lows of the weekend. We made breakfast together and went for a walk in St. Johns. Coming home we had leftovers and took a nap (more acupuncture causes napping in my life). We watched the first Blue Planet DVD and went to bed early. It was all pretty marvelous until I tried to go to sleep. Friday and particularly Saturday night into Sunday was a lot of stuff triggered, pretty early pain. Sunday morning it went straight into my left hip and leg, turning into spasm after spasm. The hip pain that for years has been associated with the herniated disc shows up, after being all but gone for two weeks, when I'm seriously emotionally triggered. Can it be any more obvious? I'm trying to stay focused on how I was able to be present to the pain, the terrifying shame I felt. I retained the ability to talk, to fully, if haltingly, communicate what was going on. I was even able to visualize the way my body felt inside - seeing the pain like lava. This is progress. I didn't shut down completely. In the middle of the big down, feeling enormously triggered by childhood trauma, I taught yoga. One of those times where I just get out of the way and allow that lineage to teach through me. The class ended up running long and I felt grounded, if unsteady. Coming into a shaky evenness after the storm of emotion and memory. I worked on small art projects Sunday afternoon, in part alone with the cats. I did no chores. I didn't feel guilty about it. A picture I took Saturday really resonated with me when I saw it had come out. It was a quick decision to take it, seeing the lines suddenly and clearly. 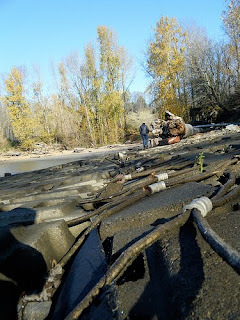 We were walking back out of the SuperFund site of Willamette Cove. Cables cut, restoration begun, but toxic areas remain. Native trees reclaim the shoreline. sweet sherri – please make art with those last two sentences and that photo. sorry it's been such a tough week. love you!